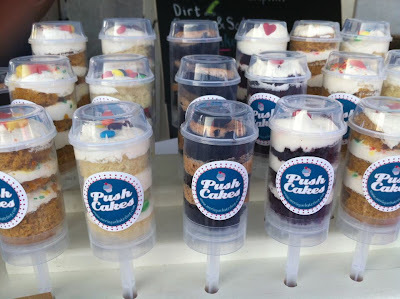 Life with Dylan: Meringue Bake Shop's PushCakes are truly an original! These look fabulous! I love stumbling upon small food businesses just like this. We have a question at Goodies For Gifts: Do you plan on shipping PushCakes nationwide? Our fans would love them especially the Birthday Cake! I haven't tried one yet but they look delish! I have never had a PushCake, being as old as I am and having traveled the world, you would think that there is nothing out there that I have not at least sampled. Now I find out about PushCakes, and the write up about them have me very upset that IO was not able to savior at least one while I lived there. I now live in Washington State, and we have great seafood and even the best Dim Sum to be found, we have no PushCakes. How can we as a food loving State tolerate this? I say Ney Ney, we can not. We must therefore, obtain a winning entry in order to have a sample of this delectable treat sent our way and thus allowing us to have the honor and bragging rights of winning this illustrious treat. If I should fail in my attempt, there of course would be nothing left to live for. I have done it all, explored all, sampled all, except that last elusive item, The PushCake. My kids LOVE this idea! I explained the concept and they thought is was OUT-OF-THIS-WORLD! Cannot wait to try. PushCakes are the best dessert idea ever! I'm coordinating with a couple other girls to go try them at the Meringue Shop stand @ the farmers market and hopefully place an order for my little girl's 1st birthday! BTW, my favorite flavor is Queen of Hearts! PushCakes are the BEST dessert idea EVER! I am coordinating with a couple other girls to visit the Meringue Bake Shop stand @ the farmers market within the next month! I can't wait to sample these goodies and hopefully place an order for my little girl's 1st birthday. BTW, Queen of Hearts is my favorite flavor! Queen of Hearts all the way!! I love your blog tagline, 'Surviving my life with Dylan...' I just had my first a few months ago. It's been amazing, but I'm in total survival mode! Kristin is awesome! I have had the pleasure of eating her cupcakes, but haven't had a PushCake yet. The Orange Crush flavor is out of this world! Kristin is awesome and so are all her baked goods! I haven't had a chance to try PushCakes yet, but the Orange Crush cupcakes are unbelievably delicious. And I already follow PushCakes on Twitter, too! I discovered PushCakes when I was in Chinatown at the Chinese New Year parade. They are amazing. I have been craving them ever since!! I discovered PushCakes in Chinatown after watching the Chinese New Year parade. They are amazing and I have been craving them ever since!! Orange Crush is by far my favorite, but my kid likes the chocolate one. Nom nom nom. I already like PushCakes on Facebook (mostly so I can drool over the pictures). I already follow @pushcakes on Twitter (I'm pretty sure I'm stalking Kristin). Love the Queen of Hearts but it's the only one I've had! I adore Kristin's pushcakes! My favorite flavor is birthday cake. I would love Banana Split. My fav is the Queen of Hearts... I tried them at an event and they were delicious. I follow on Facebook (Living Mi Vida Loca). My favorite flavor is Banana Split. Red Velvet, Red Velvet Red Velvet. Obsessed. I like Pushcakes on twitter. I love PushCakes and Meringue Bake Shop. Orange Crush is the best - reminds me of when I was a kid and would stalk the Good Humor Man for his ice cream! We had a red velvet and the kids were cuckoo for it! I like PushCakes on FB. I follow you Push Cakes on twitter. I follow PushCakes on Twitter! I like PushCakes on Facebook!